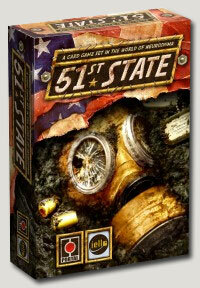 Toy Vault, Inc. is pleased to announce the US release of Portal Publishing's 51st State, the critically acclaimed, post-apocalyptic multi-player card game which debuted at the 2010 Spiel Festival in Essen, Germany should be in stores this March. 51st State includes 16 Faction cards, 84 Location and Contact cards, and 198 cardboard tokens, and is now available with a suggested retail price of $39.99. Pretty solid game play. If you're a fan of the Neuroshima world, this is a no-brainer purchase. The game lends itself well to customization. Great game, similar to race for the galaxy if you like that type. a good one.